Safety is a major concern in the food manufacturing process. Manufacturers want to make sure that all the food on their line is safe and not contaminated with metal or other foreign objects. When manufacturers want to make sure they have no metal in their products they use metal detection systems on the conveyor line. Why type of system you choose is totally dependent on your needs and application. When products pass through the metal detection system and are found to be contaminated how should they be removed from the line? Rejection conveyor systems can vary widely. They can be as low-tech as just stopping the line and sounding an alarm until someone can remove the questionable product. This is a good option for production lines where there is room and time for someone to always be near the detection system. Once the product is removed the line will start again until the metal detector finds another questionable product. They could also be as efficient as a retracting conveyor. When the metal detector detects a contaminant in the product the tail automatically retracts making the questionable product drop into a reject bin. This is really nice because there doesn’t always have to be someone near the metal detector. Someone just has to come by and empty the reject bin every time it gets full. Another reason an automated rejection system is nice is if you have a tighter space where an employee couldn’t easily fit or you can’t spare employees to go check the line every time the alarm to go off you don’t need to worry because the system can take care of rejecting questionable product for you. 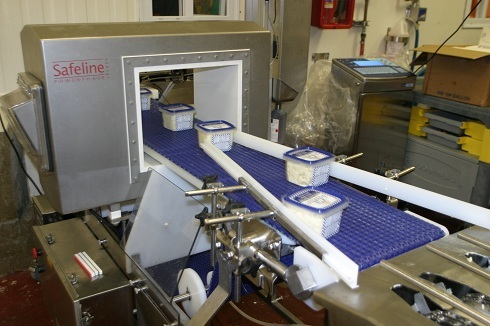 Whatever your food production needs Dorner can configure a system to fit your needs. Our 7X series conveyors are designed for effective sanitation and protection from contamination. The 7X conveyors are designed to be 100% accessible for easy one person cleaning that takes only a few minutes. They are made with rounded stainless steel frames with minimal horizontal surfaces for optimum cleaning and FDA approved belting options.